1. Indicate whether the following statements are True (T) or False (F). 2. Make a sketch of the human nerve cell. What function do nerve cells perform? The function of a nerve cell is to transmit messages to the brain and also to take away messages from the brain to the receptor organs. (a) Cytoplasm: It is a fluid that fills the cell and occurs between the plasma membrane and the nucleus. Cell organelles such as mitochondria, ribosomes, Golgi bodies, etc. are suspended in the cytoplasm. The cytoplasm helps in the exchange of materials between cell organelles. (b) Nucleus of a cell: Nucleus is the master of the cell. It commands all the functioning of the cell. It is generally located in the center of the cell and is spherical in shape. A membrane called nuclear membrane separates it from cytoplasm. It contains the genetic material DNA and RNA in it. This porous membrane allows the transfer of material in the nucleus and cytoplasm. Nucleus contains a dense body called Nucleolus which actually contains Chromosomes, the genetic material. 4. Which part of the cell contains organelles? Cytoplasm is the part of the cell that contains various organelles such as mitochondria, ribosomes, Golgi bodies, etc. 5. Make sketches of animal and plant cells. State three differences between them. They are generally small in size. They are usually larger than animal cells. Cell wall is absent. Cell wall is present. Vacuoles are small in size. Vacuoles are larger in size. No other animal cell possesses plastids except for the protozoan Euglena. Plastids are present. 6. State the difference between eukaryotes and prokaryotes. 7. Where are chromosomes found in a cell? State their function. Chromosomes are found in the nucleus of a cell. Their function is to carry characteristic features of parent cells to the daughter cell means, from parent to offspring. 8. 'Cells are the basic structural units of living organisms'. Explain. In Biology, the basic unit of which all living things are composed is known as ‘cell’. The ‘cell’ is the smallest structural unit of living matter that is capable of functioning independently. A single cell can be a complete organism in itself, as in bacteria and protozoans. A unicellular organism also captures and digests food, respires, excretes, grows, and reproduces. Similar functions in multi-cellular organisms are carried out by groups of specialized cells which are organized into tissues and organs such as, the higher plants and animals. Hence, ‘cell’ is known as the basic structural and functional unit of life. 9. 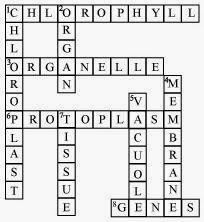 Explain why chloroplasts are found only in plant cells? Chloroplasts are found only in plant cells because they are required for photosynthesis. 10. 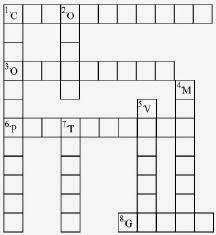 Complete the crossword with the help of clues given below.